“STATE OF WONDER,” is a 21st century fairy tale. The Ann Patchett novel explores, among many things, the potential for human excellence, the power and consequence of romantic love, the implications of paternal presence and absence. Perhaps most importantly, the story reveals our willingness to deceive, disappoint, and betray one another. But also our ability to persevere and survive. Read State of Wonder twice. It’s that good. I missed most of the message on first reading. I’m planning to give it a third go, a few years hence. I can’t wait to see how the story stands the test of time. After two readings, I think it has “classic” stamped all over it. One reader called State of Wonder “A life-changing experience.” For anyone paying attention, it is a life-informing experience, at least. As a story, State of Wonder is a tale of grand adventure, bordering on science fiction, in a faraway and dangerous place. The journey takes us from frozen Minnesota to steaming Amazon jungle. It’s the archetypical plot of ancient and modern literature. To wit: The hero leaves home; the hero returns home. First the hero, Dr. Anders Eckman, departs on a great quest, which includes birdwatching and searching for a disappeared mad scientist. Dr. Eckman contracts a tropical fever and perishes. Now comes the heroine, Dr. Marina Singh, an unwilling volunteer on a mission. The heroine departs partly because she’s guilt-tripped into it, and partly because she’s in love with the anti-hero, a CEO named Mr. Fox. He stays home, at least for now. What a man! Mr. Fox must remain behind to keep the ship from sinking. In this case, the ship is a corporation. But never mind. Is the brilliant (mad?) scientist, Dr. Annick Swenson, seemingly lost in the jungle without even a telephone, the true heroine? Or is she the villain? Whatever, Dr. Swenson understands the hard truth, when it finally slaps her in the face. “I don’t know another story to match this,” says she. Correct. There is no story to match this, at least not since Homer. Or maybe Adam and Eve. Forgive my hyperbole. The icy Dr. Swenson inspires unwavering loyalty, admiration, and fear. She’s a central character here, but not THE central character. The central character is our overeducated and slightly naive heroine, Dr. Singh. All the leading characters seem to be doctors, if you don’t count the endearing little boy, named Easter, who happens to be deaf. Marina Singh is a humble but daring protagonist. She wanders alone in a sweltering, alien city, braving deadly insects and malaria day and night. She travels by small boat down unknown tropical rivers, deep into the dense Amazon jungle. Our heroine is fearful, but overcomes all fears. She battles a fire-breathing dragon. And slays it with a machete. Dr. Marina Singh performs life-and-death surgeries under primitive conditions. She ingests the bark of the tree of eternal fertility, but eschews the hallucinogenic blue mushrooms. Most importantly, Marina discovers a great truth (I’m not giving it away!) and uncovers a great deception (read the book!). After all these labors, Marina finds and rescues our original lost hero (Dr. Birdwatcher) and returns him home at last to his family in Minnesota, where it is now springtime. Ann Patchett has written five other novels and a couple of non-fiction memoirs. She’s only of a certain age, so probably she will write many more books. State of Wonder is, I believe, her masterwork. My review of Ann Patchett’s novel “Run” is here. I’m tempted to nominate State of Wonder to be a Great American Novel, except that most of the story takes place in the Amazon jungle. Tell me, have you read State of Wonder? Or Run? What did you think of Ann Patchett’s work? 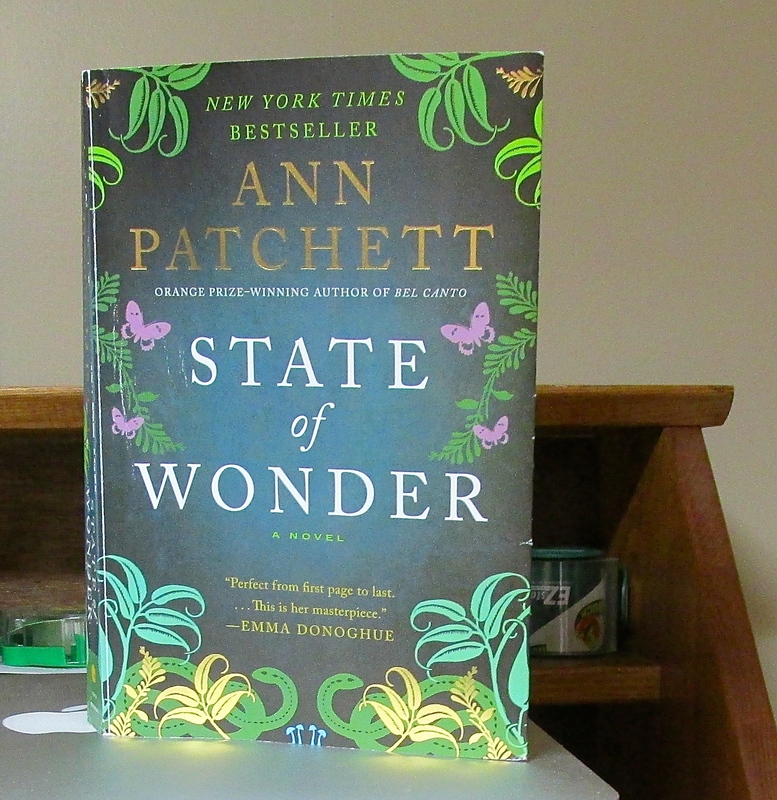 This entry was posted in Books, Life and tagged Adventure, Amazon jungle, Ann Patchett, Fiction, Literature, Science, State Of Wonder, Writing by Editor (Retired). Bookmark the permalink. Thoroughly enjoyed State of Wonder and Bel Canto. Run – no so much. When you have time for another good yarn, read Flight Behavior by Kingsolver. The book addresses numerous themes, including Science v. Religion, elitists, Appalachian economy, Climate change, Monarch butterflies, etc, etc. My best read in 2013. Thanks Lynn! Flight Behavior is at top of my list. Right this minute I’m reading the follow-up to Black Swan, which is “Antifragile” Things That Gain From Disorder,” by Nassim Nicholas Taleb. I am still in angst over the ending rescue scene…… I keep turning it over in my head, how everyone fought over Easter and all he was left with was “terrified confusion”. However poorly it reflects on my literary tastes, I have to say that scene ruined the book for me. Up until then, I was in a State of Wonder. Now I am just in a State of Sadness. Thank you Susanna. You went right to the moment of greatest drama in the story. How quickly and unexpectedly it happened! (Although the author had built up a modicum of suspense.) I can understand your sadness. For me, it was more like shock and dismay! I can’t imagine a more sudden and shocking climax to a long-building drama. Easter, the little boy, the picture of innocence and goodness! One minute, the amazing rescue (might you call it a resurrection?) of the long-dead Dr. Birdwatcher and his happy reunion with the beloved Easter! And THE VERY NEXT MOMENT, the instant BETRAYAL of the innocent child!! The unimaginable BETRAYAL OF LOVE without hesitation! (I’m not sure, did either Dr. Birdwatcher or Dr. Singh hesitate for even a heartbeat?) Easter’s life traded for Dr. Birdwatcher’s life. Simple as that. With immediate (unthinking? instinctive?) agreement by Dr. Birdwatcher and Dr. Singh. No say in the matter for Easter. That’s why I wrote at the beginning: “Perhaps most importantly, the story reveals our willingness to deceive, disappoint, and betray one another. But also our ability to persevere and survive.” Three words: deception, betrayal, survival. Even at the end of the book, after the greatest betrayal of all, the betrayal of Easter, the reader is offered one last HOPE of perseverance and survival. Easter is, after all, a smart and resourceful child. That much is clear. And his native tribe has no desire to harm him, but only to rejoice in his return. (Like Dr. Birdwatcher, Easter returns after being presumed dead. The return of the prodigal sons?) Perhaps Easter will perceive that he is loved and valued by his original tribe. Alternatively, because Easter is smart and resourceful, the reader is allowed to HOPE that Easter will easily escape the tribe and find his way back to Dr. Swenson’s camp. Which leaves the reader with a dilemma: Whom does Easter belong TO? Or is it belong WITH? Dr. Swenson or the tribe of his birth? I imagine it will be Easter himself who will have to choose.